Purchase this silver ice metallic 2014 Texas Edition Chevrolet Silverado 1500 LTZ Crew Cab truck at a great deal today! 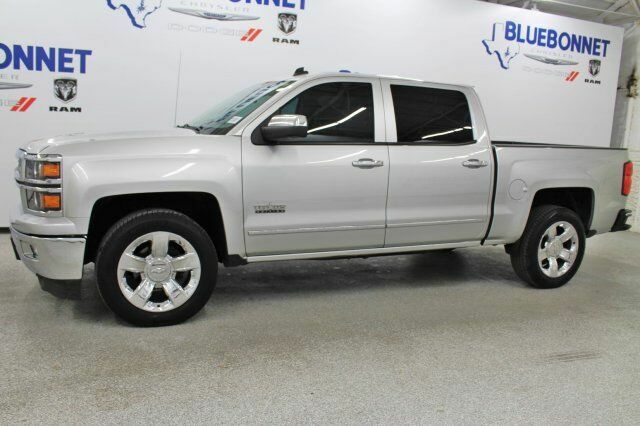 This sporty pick-up is loaded with gray leather interior, wood-grain accents, tinted windows, a touch screen display, MP3, SIRIUS XM radio, Bose audio, OnStar, a back-up camera, cruise control, heated/cooled power seats, & so much more. This vehicle's 5.3 LTR V8 FlexFuel engine is in excellent working condition for maximum towing capacity! The tires have at least 3/4 of their life span left, & the mileage represented is 100% accurate. With a smooth shifting auto transmission & all power equipment working properly, each ride will be one of excitement & pleasure! If you have any questions about this amazing find or any of our other vehicles, please call our sales office. Thank you for your interest & we look forward to hearing from you. TEXAS EDITION, 1LZ TRIM includes chrome mirror caps, chrome door handles, Texas Edition badging and 20" wheels (Includes (RD2) 20" x 9" chrome wheels and (UQA) Bose Sound speakers.